Jaitley had said in Rajkot that Parliament sessions were often rescheduled to ensure they did not overlap with elections and claimed the Congress had done so too in the past. 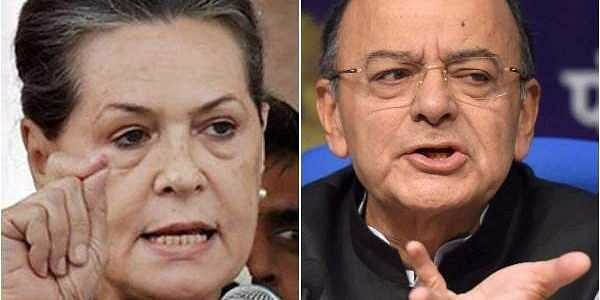 NEW DELHI: The Congress today termed as "unfortunate" the remarks by Finance Minister Arun Jaitley against party president Sonia Gandhi, who had accused the Modi government of sabotaging the winter session of Parliament on flimsy grounds. "Since Finance Minister used a word which deserves to be condemned....This is unfortunate; it should not happen in the largest democracy of the world what we are seeing," Congress senior leader and deputy leader of the party in Rajya Sabha Anand Sharma told reporters. He said the government is trying to evade and avoid accountability in Parliament "on its acts of ommission and commission". Regular sessions of Parliament are important, he said, "We want to take a very clear distinction that the election in a state has never come in the way of the summoning or convening of the Parliament sessions in the past," he said. Sharma said Finance Minister’s statement yesterday was a "knee jerk response" and he should have checked the facts. "He is factually wrong and we reject what he has said that in 2011 a similar situation was there. Why I am saying so -- that in the last few decades, we have gone through record, which is with us, that at least in this century it has not happened. "In 2011, to correct the Finance Minister, the date of summoning of the Parliament -- both the Houses -- by the President of India, was on 03rd November 2011," he said. Jaitley had yesterday said the winter session of Parliament would be held and the Congress stands "totally exposed". He had hit out at Gandhi for accusing the Modi government of sabotaging the winter session of Parliament on "flimsy grounds". He had alleged that the opposition party had delayed a session in 2011 and even earlier because the sittings coincided with election campaigns. "It has been a tradition and it has happened several times that Parliament sessions are rescheduled when an election is happening," he told reporters. "The Congress has given the most corrupt government in its ten years of rule, while Narendra Modi has given the most honest government. By forcibly saying that a truth is a lie does not make it a lie," Jaitley had said.